A trailer affects many aspects of how your vehicle responds when you are driving. In this article we’ll tell you what you need to know about safe towing, what you are and are not allowed to do, the maximum weights, and advice for driving with a trailer. It covers trailers on vehicles with a GVM (gross vehicle mass) of 4500kg or less, not heavy vehicles. Trailers are non-powered (except for lights and brakes [if braked]), and non-steered. They are dragged by your vehicle and your vehicle must be capable of handling the weight and characteristics of the trailer. All trailers add force to the rear of the car. When the car is braking, the trailer pushes forwards. When the car is accelerating, the trailer is resisting the acceleration and therefore slowing the car down. At all times the trailer will be exerting some force on the tow ball or towing hitch, although usually this is less than 100kg. 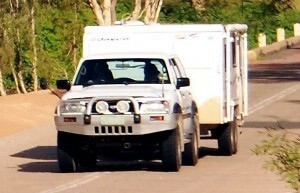 As the size and weight of the trailer increases, the effects on the towing vehicle increase, too. The trailer dynamics affects fuel consumption, acceleration, braking, cornering ability, manoeuvrability, aerodynamic properties and the driver’s rearward vision. 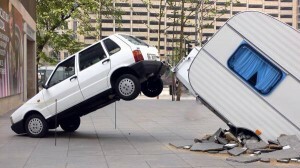 This applies particularly to high-sided box trailers where strong gusts can move the towing vehicle around considerably. If your car and trailer is being overtaken by a higher sided vehicle, such as a truck and trailer, this can create a temporary shield to crosswinds and when truck clears your vehicle, you can be hit with an unexpected gust. The same applies for passing through tunnels or past significant buildings that might block crossswinds. This applies more to trailers with taller loads, box trailers and horse floats. Headwinds will affect your acceleration even more than usual and, on hills, can cause you to lose speed very quickly. Trailer suspension tends to be agricultural compared to car suspension, and serious bumps in the road can upset the stability causing bump steer, or your load to shift (note: you should always ensure your load is safely secured and if you have been over a particularly bumpy patch of road, it pays to stop and check your load). Low, static loads are the easiest loads to pull. Tall loads such as large boats require special care when cornering as the trailers have a lot of weight high up. Towing horses is a completely different experience as every time they move you will feel it. A trailer creates a significant load on your car. It’s important you don’t exceed these loads otherwise you could cause an accident. The manufacturer of your vehicle will have published figures for the maximum loads that can be towed on braked and unbraked trailers. Usually these are between 500-750kg on an unbraked trailer and anywhere from 1000-3500kg on a braked trailer, depending on the type of vehicle. Smaller cars might have 500kg and 1200kg, whereas a large ute or SUV could be 750kg and 3500kg. A braked trailer means that the trailer has its own brakes; an unbraked trailer has no brakes. You will need a tow ball, tow hook or tow coupling that supports the weight that you want to tow and the type of connector the trailer has. These must be properly designed and fitted, and you must not exceed their stated limits (“rated capacity”). Tow bars will be stamped with the maximum rated capacity, the manufacturer’s part number, and/or the make and model of the vehicle it’s intended for, unless it was built prior to 1992, or if the tow bar is a permanent part of the vehicle. Couplings must be strong enough to take the weight of the trailer when fully loaded. You may also want to use a load equaliser if you are towing a large trailer or caravan. These help distribute the load more evenly and maintain normal suspension height. Check with the tow bar manufacturer before using one. A working lights coupling is required so that the trailer lights work with the vehicle lights. If the trailer is fitted with power brakes, there may be a brake coupling. The coupling must have a positive locking mechanism, i.e. it must be able to be released regardless of the angle of the trailer to the towing vehicle. Safety chains must comply with Australian Standards. Trailers less than 2500kg when loaded must be fitted with one safety chain, whereas trailers more than 2500kg must have two safety chains. The chains should be short enough to stop the drawbar from hitting the ground. If using two safety chains, cross them over. You must not tow a caravan with passengers riding inside. 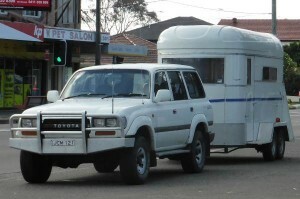 Rear number plates and lights must not be obscured by the tow bar if there is no trailer connected to the car. If required, the trailer must have its own registration and number plate. 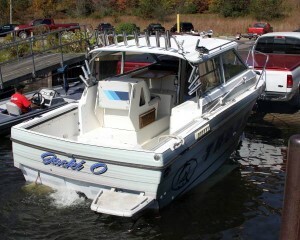 If you are towing a boat it’s likely you will launch the boat from a boat ramp. These can be wet and slippery therefore it’s advisable, especially for larger boats, that your vehicle has four wheel drive to ensure it has enough traction to get back up the boat ramp when pulling the boat out of the water. For regularly towing large, heavy trailers, use high quality brake fluid that will resist overheating. Extra mirrors that allow you to see past a wide trailer can help with visibility of traffic approaching from the rear, and with manoeuvring the trailer. Vehicles with an automatic gearbox may need an additional oil cooler, particularly if you live in a hilly region. If you want to tow a trailer heavier than the vehicle manufacturer recommends, you may need to have structural reinforcement, upgraded transmission and brakes and other load-distributing devices installed. Trailers are only for loads, not people. It is illegal for people to ride in trailers or caravans. Towing more than one trailer with a car is not allowed. You are not allowed to tow a trailer if you are a learner driver; P1 car licence holders can tow small trailers with up to 250kg of unloaded weight. When towing and driving on a road without street lights, stay at least 60m behind heavy vehicles or other vehicles towing trailers unless you are overtaking. This gives drivers overtaking you a gap to pull into, and also ensures that you have extra room to stop if you need to. What should you check on your trailer? Check the tyres still look like they’re at the correct inflation. Reversing requires a new set of skills as the steered direction of the car will result in the trailer turning in the opposite direction, and visibility will be more limited. It’s advisable to have someone outside the car helping you with reversing. Sudden changes in direction can cause the trailer to start to sway (snaking) and eventually jack-knife your vehicle, or tip on their side. Newer cars have trailer stabilisation features that help prevent this. If this does start to happen, braking can make it worse. If you can operate the trailer’s brakes by themselves, this will help; if not, use your brakes as a last resort. Use the gearbox to assist with braking, particularly on long downhill sections so that you avoid brake fade. Driving with a trailer takes more concentration therefore you will get tired quicker. Plan more stops than usual. The unladen mass of the towing vehicle if the trailer doesn’t require brakes. 2001-4500kg loaded weight: braking on all wheels and an automatic breakaway system in case the trailer becomes detached from the vehicle. Brakes must be able to be operated from the driver’s seating position. Loads must be properly secured and contained within the trailer (within limits). A load can’t project more than 150mm beyond the trailer’s width, or 2.5m overall width, whichever is less. Projecting loads should be securely fastened so they don’t tip. Loads can project from the back of the trailer, but if they project more than 1.2m then a red flag of at least 300mm square (and clearly visible) must be tied to the back of the load. Loads may project forwards. If towing a projecting load at night, a red light or two red reflectors must be attached to the end of any projecting load. The overall length of the vehicle plus trailer plus load cannot exceed 19m. Keep loads as low as possible and as close to the trailer axles as possible. Loading around 60% of the total weight forward of the centre axle is ideal. This means that the trailer is exerting a mild downward force on the rear axle of the towing vehicle, which is safe. If the trailer exerts lift on the rear axle, it reduces the grip for the towing vehicle and increases the likelihood that the towing vehicle could spin on a corner. Roughly 5-10% of the mass of the trailer plus load should be supported on the tow ball, and the trailer drawbar should either be level or slightly nose down, and never nose up. How is fuel economy calculated and how accurate is it?